Desert Vacation Villas in Palm Springs - The Best Family Resort! On my recent trip with my family to Palm Springs, I had a lovely 3-night stay at Desert Vacation Villas. When we travel as a family, I love to save money by cooking myself. Not only does cooking from my hotel help me save, but it also allows us to be able to relax and enjoy a meal alongside our toddler either poolside, while watching a movie, or on our balcony overlooking Desert Vacation Villas‘s pool. This hotel has one of the best hotel kitchens I’ve ever seen! It had a dishwasher, oven, microwave, stove, and plenty of cups, plates, and utensils so we never ran short. There is also a full-size fridge, making it very convenient to bring along everything you need to cook while travelling. Since I’m self-employed, I am always needing to take my work along with me when I travel, so free Wi-Fi is essential. Oftentimes hotels can have slow Wi-Fi, but Desert Vacation Villa’s was super speedy and reliable. While I worked, my little one could enjoy some on-demand television shows, which they have a wide free selection of on their TVs. Since Desert Vacation Villas are condo-style accommodations, our room had two bedrooms, crib, huge living room, and two bathrooms in addition to the kitchen. This made it very easy to bring along toys, work stuff, lots of change of clothes, and food without feeling cramped. My daughter couldn’t get enough of the pool! Spending time at the pool actually was what we did during the majority of our trip to Palm Springs. Desert Vacation Villas is a smaller property, so the pool is within quick walking distance from any room you’re staying in. The pool has pool noodles for guests to use and good-sized hot tub. If you’re more in the mood to relax poolside, there are wall misters you can turn on so you can stay cool in the desert heat. 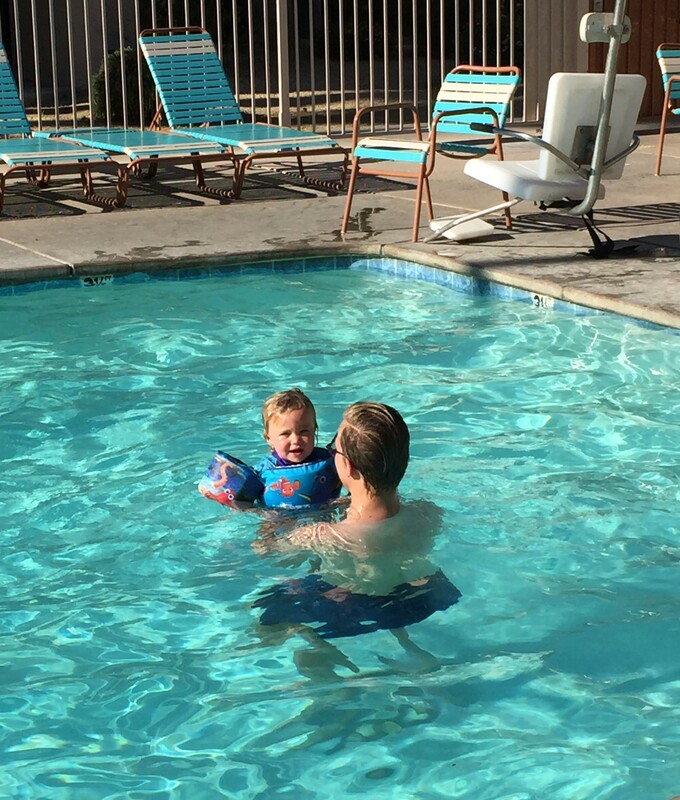 If you are headed to Palm Springs with kids, I can’t recommend Desert Vacation Villas enough! A bonus, there are lots of great restaurants and convenience stores surrounding the area, and is only a mile from the main portion of the downtown. If you head to the Villas, be sure to let them know you heard about the hotel from The Healthy Mouse! Happy travels!